Let us continue our walk through the Gospel According to Matthew. Last week we worked through Matthew 17. Last week’s look at Matthew 17 ended with a short demonstration of God’s provision for His people. I debated stopping short of that portion so that it could serve as the introduction into today’s, but decided against it since chapter 17 is such a short chapter already. Today, we’ll start with what today would seem to be a deep theological question of who would be the greatest in the Kingdom of Heaven. 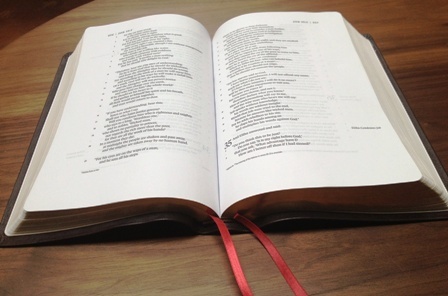 Matthew 18:1-6 (ESV) | Who Is the Greatest? Notice how Jesus addresses the question… He didn’t answer “who is the greatest” He instead charged them to focus on who will even enter. That should be a sobering thought for each of us. Now, usually when I read this passage, my thoughts go to exploring what it means to have a child-like faith, and what I need to do to cultivate such a faith (notice how the flesh is so bent in on itself always looking for works to perform to gain faith)… but this time around, my thoughts focus more on verse 6. When we talk about the dangers of false teachers and wolves in the church, maybe we should start emphasizing the need to protect the children first and foremost. My kids are 5 and 3, and right now nothing scares my wife and me more than the idea of allowing our kids to falsely indoctrinated in a public (pagan) school system… or in a Sunday School class that mishandles Scripture for the sake of entertainment. This is a bible study, but I hope you’ll allow me to share some personal application. Last night at dinner, my 3-yr-old daughter prayed for the blessing on the food. Immediately after the Amen, she said, “Daddy… you wanna know something about God? He never sins. You wanna know what God has? A Holy Spirit. And God is Jesus.” So at dinner, my wife and I discussed with our 5-yr-old and 3-yr-old the definition of sin, the nature of God, and the Trinity all while gobbling up some delicious arroz con pollo (chicken and rice). Now sure, I had to say several times, “I know it can be hard to understand, so for now we say that God is One in three persons, God the Father, God the Son Jesus, and God the Holy Spirit.” I was so moved by the experience, and the weight of the responsibility as their father and the priest of the home is heavy, particularly with what Jesus said in verse 6 above. Thankfully, it is not by my will or intellect… but by grace through faith that I can walk humbly and faithfully in my responsibility to the children God has placed in my care. This is why we don’t entertain fantasies such as santa, the tooth fairy, or the easter bunny. We refuse to bear false witness to our children about these lies and we fear causing the little ones who believe in Christ to stumble. Temptation will come… and it is necessary. It was necessary for Jesus to be tempted, we know this because the Holy Spirit led Him into the wilderness for that express purpose. But woe to the one by whom it comes. There is really poor argumentation out there that suggests that the ends justify the means. Christians should know better, but we are weak. The ends are in God’s hands… He allows the means, but He is the only Judge over all. God doesn’t tempt, but He allows it for our good and His Glory. James 1:12-14 (ESV) 12 Blessed is the man who remains steadfast under trial, for when he has stood the test he will receive the crown of life, which God has promised to those who love him. 13 Let no one say when he is tempted, “I am being tempted by God,” for God cannot be tempted with evil, and he himself tempts no one. 14 But each person is tempted when he is lured and enticed by his own desire. Part of remaining steadfast, is knowing when to flee temptation. Knowing that we are sinful creatures for sin yet remains in our flesh even though we have the Spirit of God working within us, Paul was clear in his writing of the war that rages within between our sinful flesh and the Spirit. Jesus graphically depicts the need to avoid temptation by any means necessary. Resist the devil, yes, and that includes fleeing youthful lusts. But we don’t blindly run away, James tells us to draw near to God and He will draw near to us (James 4). This parable should be held in close connection with Jesus’ charge in verses 5 and 6. The Father takes special notice of the little ones who have gone astray. Remember the millstone. He actively seeks out the one who is lost. Woe to the one by whom temptation comes! The Father rejoices over the lost that was found more than over the 99 who never went astray. This is how we are to deal with fellow members of the Body of Christ. This is how Church Discipline is to be administered. Sadly, steps 1&2 are often skipped and people jump straight to shunning and excommunication. What follows is a parable that reinforces what Jesus was teaching above, but from a different perspective… one of stewardship of God’s forgiveness, grace, and mercy. 21 Then Peter came up and said to him, “Lord, how often will my brother sin against me, and I forgive him? As many as seven times?” 22 Jesus said to him,“I do not say to you seven times, but seventy-seven times. Fellow Christians… be good and faithful stewards of God’s grace and mercy and extend forgiveness in Jesus’ Name. This isn’t a matter remedied by mere lip service… for God looks at the heart. We are to forgive our brothers from the heart… and repent of the sin of falling short of that standard. Next week we’ll be working through some tough topics such as marriage, divorce, celibacy, works-righteousness and idolatry. I look forward to continuing our trek through the Gospel According to Matthew. Until then, continue walking in faith and growing in knowledge of Christ through the reading of His Word.